"Illusionist Rick Thomas” has created a show filled with stunning illusions and spectacular beauty! With years of successful tours around the world, headline shows on some of the biggest stages in Las Vegas, and the honor of being recognized by the magic industry, “Rick Thomas” will again establish his home base in Branson! His graceful movements to music, aided by his exceptional skill at ballroom dancing, and his unique ability to keep audiences of all ages and walks of life spellbound throughout his performance, has kept “Rick Thomas” at the top of the magic game. He’s received the World Magic Award of Magician of the Year, and been honored by the Academy of Magical Arts as the Stage Magician of the Year. He’s been sought after for not only live stage performances, but for television broadcasts on many major networks and popular cable stations, including channels like Discovery, Hallmark, History, and Animal Planet as well as ABC, CBS, and NBC where he appeared on The World’s Greatest Magic. 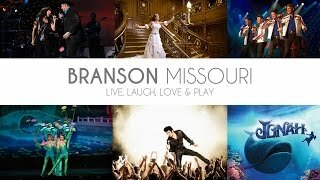 If you enjoy splendid illusions enhanced by elegant dancing and enchanting music, then “Illusionist Rick Thomas” has put together a Branson performance custom made for you! Andy Williams' Legacy Continues in Branson!